A Bitmap or Bit Vector is series or collection of bits where each bit corresponds to a disk block. The bit can take two values: 0 and 1: 0 indicates that the block is allocated and 1 indicates a free block. The given instance of disk blocks on the disk in Figure 1 (where green blocks are allocated) can be represented by a bitmap of 16 bits as: 0000111000000110. Finding the first free block is efficient. It requires scanning the words (a group of 8 bits) in a bitmap for a non-zero word. (A 0-valued word has all bits 0). The first free block is then found by scanning for the first 1 bit in the non-zero word. (number of bits per word) *(number of 0-values words) + offset of bit first bit 1 in the non-zero word . For the Figure-1, we scan the bitmap sequentially for the first non-zero word. The first group of 8 bits (00001110) constitute a non-zero word since all bits are not 0. After the non-0 word is found, we look for the first 1 bit. This is the 5th bit of the non-zero word. So, offset = 5. Therefore, the first free block number = 8*0+5 = 5. In this approach, the free disk blocks are linked together i.e. a free block contains a pointer to the next free block. The block number of the very first disk block is stored at a separate location on disk and is also cached in memory. In Figure-2, the free space list head points to Block 5 which points to Block 6, the next free block and so on. 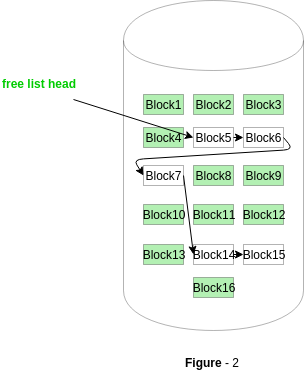 The last free block would contain a null pointer indicating the end of free list. A drawback of this method is the I/O required for free space list traversal. This approach stores the address of the free blocks in the first free block. The first free block stores the address of some, say n free blocks. Out of these n blocks, the first n-1 blocks are actually free and the last block contains the address of next free n blocks. 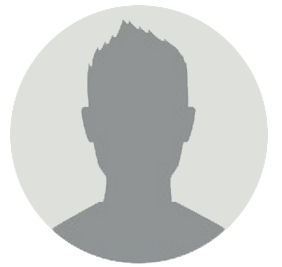 An advantage of this approach is that the addresses of a group of free disk blocks can be found easily. This approach stores the address of the first free disk block and a number n of free contiguous disk blocks that follow the first block. For example, in Figure-1, the first entry of the free space list would be: ([Address of Block 5], 2), because 2 contiguous free blocks follow block 5.